NOTICE: In this section, the terms "cold" and "hot" refer to the temperature of the coils. "Cold"means approximately -10 C (14 F) to 50 C (122 F). "Hot" means approximately 50 C (122 F) to 100 C (212 F). NOTICE: If a DTC is present, perform a troubleshooting in accordance with the procedure for that DTC. 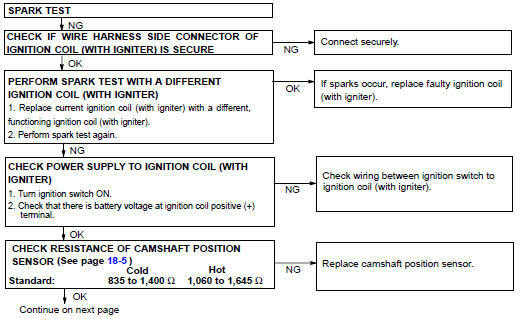 (b) Check if sparks occur. Remove the engine cover No. 1 (see page 14-24 ). Using a 16 mm (0.63 in.) plug wrench, remove the spark plugs. Install the spark plugs to each ignition coil and connect the ignition coil connectors. Check if sparks occur at each spark plug while the engine is being cranked. Be sure to ground the spark plug when checking. Replace the ignition coil if given physical impact is given to the coil. Using a 16 mm (0.63 in.) plug wrench, install the spark plugs. Install the engine cover No. 1.